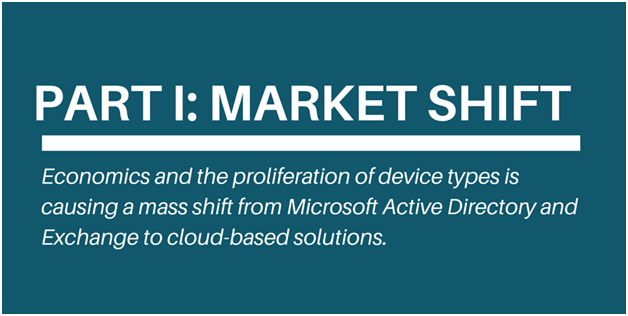 Economics and the proliferation of device types is causing a shift from Microsoft Active Directory® and Exchange® to cloud-based solutions. In this multi-part series, we look at how the movement to the cloud and shift to multi-platform organizations is dramatically changing the directory services market. Because of the embedded nature of this market, innovation to directory services has largely been missed. With the dramatic change in the IT landscape, though, IT departments are requiring new solutions to solve a new generation of problems. Security, ubiquity, and ease of use are driving this innovation. IT admins are entering a new era. What used to be an automatic decision to leverage Microsoft Active Directory (AD) and Exchange for their back-end user directory, is no longer a foregone conclusion. AD has been a core part of controlling user access to an organization’s network as well as securing and synchronizing with Microsoft devices. But large, fundamental, shifts in the technology marketplace have shaken this status quo. In today’s business environment, SaaS services have dramatically reduced costs associated with business. They are, in effect, driving down the perceived expenses allowable for any software solution. Active Directory and Exchange are a great example. AD is extremely expensive to operate. Costs associated with hardware, software, maintenance, and staffing are a great barrier to entry, and those costs increase with the size of the organization. In the past, even small organizations have had to hire a dedicated IT admin to manage their back-end services. As more companies are compelled to cut IT costs and focus on core activities, AD/Exchange have been cast aside for a SaaS solution that competes and connects with a business’s growing SaaS solutions. The proliferation of devices and mobility over the past several years has fundamentally shifted the market. Rewind to a decade ago and every businessman or woman donned a Blackberry. Now, not so much. Personal devices for mobile computing continue to diversify with iPhones (of several generations), Androids, and tablets becoming commonplace. In addition, there’s been a major shift in the enterprise from strictly Windows desktop operating systems to MacOS. Macs are infiltrating the domain of Active Directory and Exchange. In fact, only 1 in 5 devices now is still a windows device (Forbes). As IT admins have to deal with the business requirements of different OS and device types, they realize that Active Directory and Exchange aren’t the right tools for them—at least as a stand-alone solution. IT organizations used to purchase expensive on-premises, enterprise-class solutions for accounting, CRM, ERP, source control, and other areas. But not anymore. 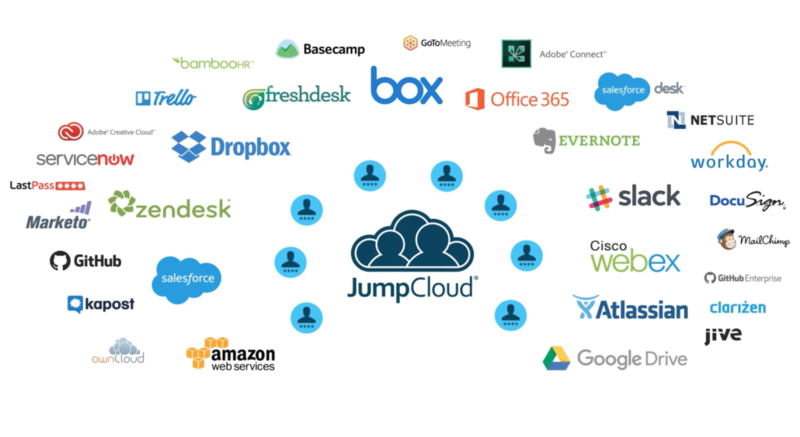 These areas are being handled by incredible SaaS-based services from the cloud. Organizations can simply purchase what they need with very little to no implementation necessary. Users easily connect with a browser from anywhere and they can accomplish their jobs. It’s cheaper, easier, and less time consuming for IT. 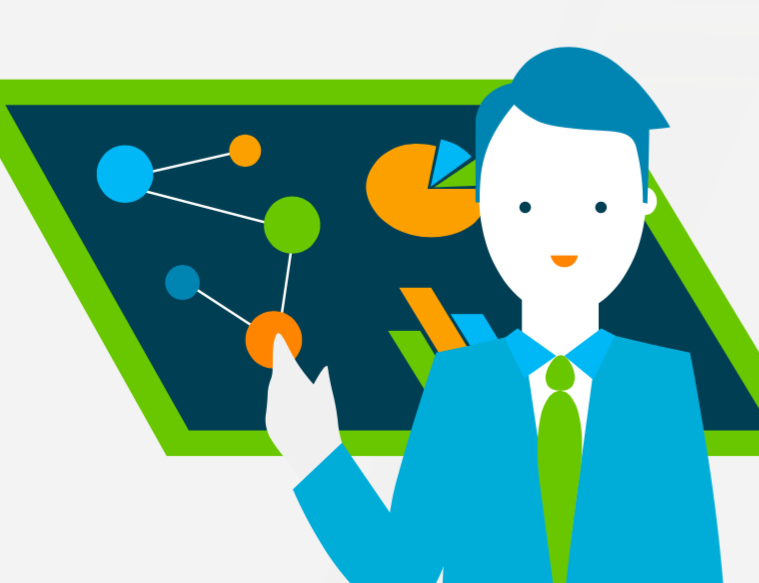 Is there a future that we see with any on-premises applications? If packaged applications could be shifted to the cloud and rented, why couldn’t our basic server infrastructure? It could and has been. Through its AWS division, Amazon created a multi-billion-dollar market that has shifted the data center from an internal, on-premise solution to a cloud-based, rented situation. What’s more, the businesses couldn’t be happier. No more data centers to build, servers to purchase, network equipment to manage, and network personnel to employ. Organizations just purchase what they need when they need it. 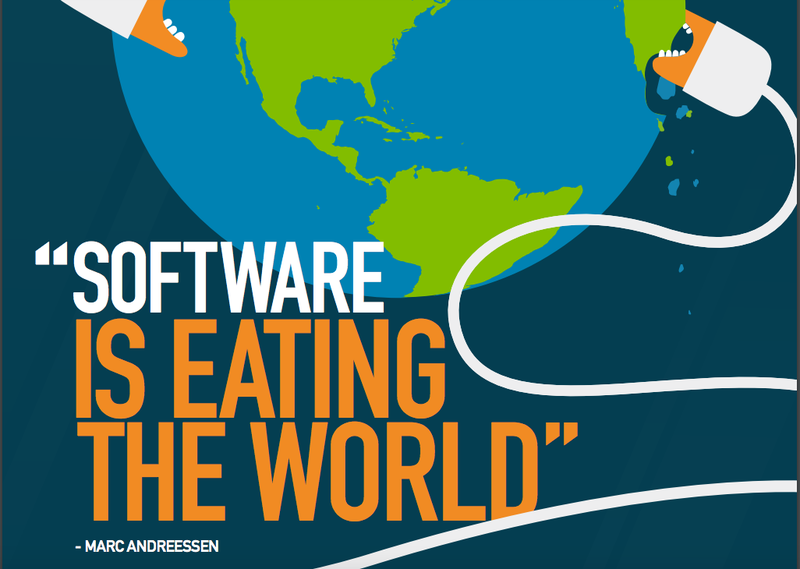 All of these fundamental shifts in IT are causing stress on the one piece of software that must cut across the whole company—the directory service. Active Directory historically has connected users to their IT resources. Unfortunately with these market shifts in the IT landscape, AD can no longer be the glue that holds IT together. Stay tuned to the rest of our series to get the insider tips in how to solve this modern IT identity management mess. As a matter of fact, Part II, Google’s Impact is ready for you. Curious as to how to update your directory on the cloud? Check us out!